It reads "Thank you for leaving this wonderful gift. Every time I look at it, I think of you." Here is the story. It was August, a few hours after I had mowed the lawn I went outside to find someone had left us a present. It was lying right next to the sidewalk. A dog owner was either too lazy or too fancy to clean up after their pooch. The thing about people who don't scoop poop is that no one likes them. Everyone, including other dog owners hates these people. If you want a dog, you really need to take responsibility for their actions and the one action they do daily is crap on someone's lawn. You have to pick it up and throw it away. It isn't hard, you use a plastic bag to do it. 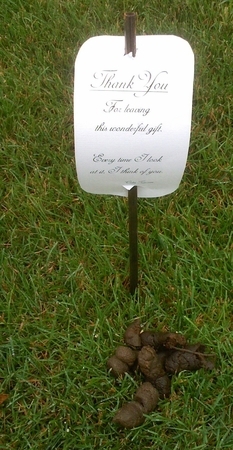 This isn't the first time someone's dog had crapped on my lawn, it has happened countless times. This particular pile was a bit larger and more conspicuous than most. This time I felt like I should respond. The solution would be to shame this person into scooping their poop. I created the dog poop thank you note. If you have a similar problem, you are more than welcome to rip-off the design for your own use.